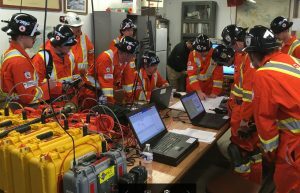 GOLDEN, Colo. – Laurentian University’s Bharti School of Engineering students won the 2017 Intercollegiate Mines Emergency Response Development (MERD) competition held recently in this Colorado town. The team from Sudbury, Ont., placed first in the first aid and the field competitions, earning the overall title. The team from the Bharti School of Engineering beat out international competition to claim the 2017 Intercollegiate MERD title. The first intercollegiate MERD was held in 2011. This year’s contest was held over two days and tested teams from University of British Columbia, Freiburg University (Germany), Montana Tech, South Dakota School of Mines, and Colorado School of Mines. The competition consists of mock disasters that are created in an underground mine to train teams in a realistic emergency search and rescue setting. It included a field competition where teams had to put out an actual underground fire, a technician test, and a first aid test. Visit http://www3.laurentian.ca/engineering/ to learn more about available programs in mining, chemistry and mechanics.